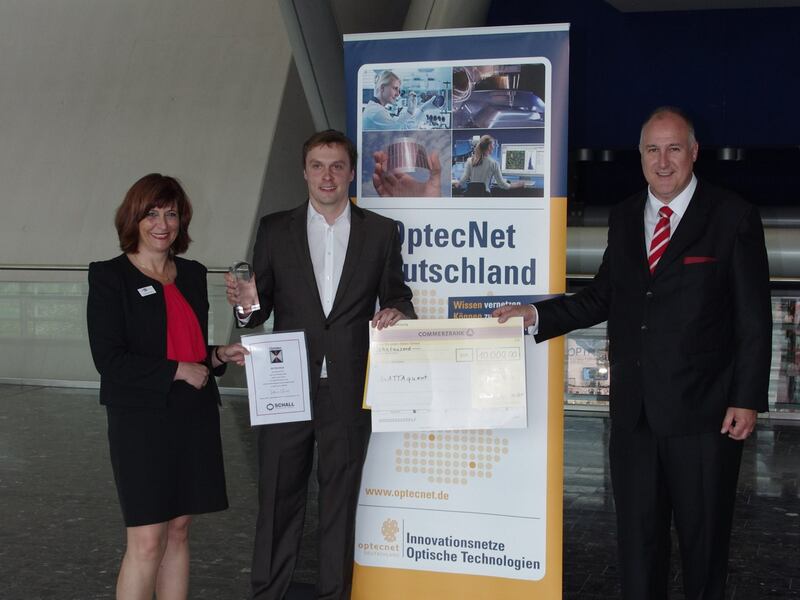 GATTAquant wins 1st Place at OptecNet Start-up Challenge. Daniela Reuter (Board of OptecNet Deutschlands e.V.) congratulates and presented the winner's trophy, the cheque for 10.000€ and the voucher from Schall for an exhibition stand on the Optactec 2018, together with the jury chairman Dr. Thomas Kessler (CEO of Jos. Schneider Optische Werke GmbH) to Dr. Jürgen Schmied, CEO of the GATTAquant GmbH. The second place went to sicoya GmbH and the third place went to UVphotonics NT GmbH.